One of the most important elements of a residential or commercial kitchen is the countertops. Perhaps you have your eye on quartz countertops. Price, aesthetics, functionality, health and sanitation, and maintenance concerns are important considerations. The price of quartz compared to natural stone depends on the selection. For example, a high-end quartz will cost more than a low-end granite. Similarly, a high-end granite will cost more than a low-end quartz. There are delivery charges to take into account, as well. Delivery charges vary, depending on the type of quartz or stone you select. The appearance of quartz has come a long way since the early days, when it came in flat yellows and beiges and only remotely resembled natural stone. Modern quartz comes in virtually any style or design, with a wide variety of colors and veining, so it is very likely you will be able to find a quartz top that is compatible with surrounding decor. Functionality is a major consideration when selecting a countertop material. 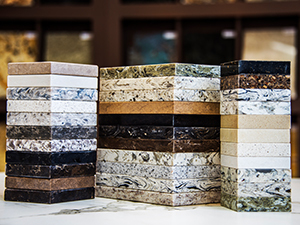 How will your countertops be used from one day to the next? Quartz is a popular choice for residential kitchens, where durability and aesthetics are a high priority, but in very high traffic commercial kitchens, stainless steel may be the better option. If you are planning on doing a lot of baking, a marble work surface will outperform quartz in maintaining a cool temperature for kneading dough. Another functionality consideration is what type of sink you want for your kitchen. Quartz can accommodate under mount sinks, however, it cannot be fashioned into integrated sinks. Quartz is an ideal countertop choice for schools, workplaces, and other sensitive environments, because it is low VOC (Volatile Organic Compounds) and resistant to mildew, mold, and bacteria. While quartz is often sold as “maintenance free,” it is not indestructible. With extensive use, quartz surfaces can eventually become scratched, stained, or otherwise damaged. Fortunately, most of these problems can be corrected with professional restoration services. Feel free to contact us to answer specific questions you may have as you decide whether quartz is the right countertop material for your kitchen.